As one of the most versatile lightweight gloves, the Gara Evo Women’s Gloves are the backbone of a light ‘n fast skier’s hand-gear quiver. The gloves feature an ultralight wind-mitten that is stowed in the back of the palm as opposed to the cuff with similar gloves. 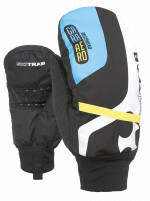 This helps the glove fit better, maintain a bit of extra insulation, and provides a nice spot for a hand-warmer. The leather palm is durable, dexterous, and will withstand a generous amount of abuse. The back panel is made of Schoeller fabric that is breathable, water-resistant, and finished with a light layer of fleece insulation. Best of all the glove is comfortable. Anatomically stitched fingers are shaped for perfect fit while grasping a pole or ice axe and the light lining caresses your skin. Neoprene cuffs help seal out the elements. 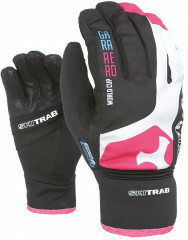 The Women’s Gara Evo WC are a great glove for touring, training, and racing. Air-Net Tech insulation retains more warmth than other gloves in the same weight class. Wind-mitten pouch is on the back of the hand which lets you strategically place a hand-warmer. Air-prene cuffs are warm and make it easy to seal out the elements. Thumb and palm are reinforced with AMARA to increase durability. Terry cloth nose-wipe and goggle-wipe live on the thumbs. Hey guys! Just curious if there are any sizing guidelines for this glove. Taylor- We dont have have any guidelines. But one of the girls here usually wears small gloves in other brands and the small fit well for her. Palm width is 3.25" and length of her hand to the end of her middle finger is 6.5"